Well, the games this past weekend weren't the best once again. Two were blowouts and the two other were competitive but not all that compelling. This has been a theme in the playoffs after two weeks. And the fantasy output in these games has not been of the charts. There were some bigger performances this weekend, though. A few players really carried fantasy teams to victories. Fantasy Stud: Damien Williams. Williams continued his great play as the lead back for the Chiefs. He ran 25 times for 129 yards and a touchdown. He also caught five passes for 25 yards, giving him 154 total yards and s score. Williams has 100-yard games two of his last three and touchdowns five straight. Williams could be playing himself into a prominent role with the team going forward. He has been great in a starting role for the Chiefs. Fantasy Dud: Andrew Luck. Luck seemed primed for a big game against a defense that struggled much of the year. Well, it didn't play out that way with Luck struggling much of the game until finding the end zone late with the game out of hand. Luck was 19-of-36 for 203 yards and a touchdowns without an interception. Luck still had a great rebound season and seems back to his old self, which is really encouraging going forward. Game Notes: Tyreek Hill had his usual big showing. He had eight receptions for 72 yards and ran once for a 36-yard score. He had 108 total yards and a score in the game. Travis Kelce hit the 100-yard mark for the sixth time this season. He caught seven passes for 108 yards on 10 targets. Fantasy Stud: C.J. Anderson. Despite Todd Gurley back and healthy, Anderson led the way for the Rams rushing attack. He had 23 carries for 123 yards and two touchdowns. Anderson had three straight 100-yard games and is clearly a big part of this offense even with Gurley back. Anderson is going to get his chances as long as the Rams keep dominating running the ball. Fantasy Dud: Jared Goff. With the Rams having so much success running the ball, Goff didn't have to do much in this one. He was a bust for fantasy teams, going 15-of-28 for 186 yards without a touchdown or an interception. Goff has cooled some down the stretch, though, having one or no scores four of his last six games. He also has fewer than 200-passing yards three of those games. Game Notes: Todd Gurley returned from his knee injury and looked near full strength. He ran 16 times for 115 yards and a touchdown, averaging 7.2 yards per carry. Michael Gallup had six receptions for 119 yards. This was the first time in his career he hit the 100-yard mark. Gallup scored touchdowns two of the last four games. 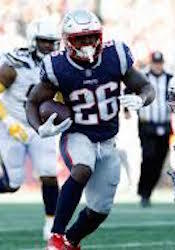 Fantasy Stud: Sony Michel. Michel dominated carries for the Patriots and ran all over the Chargers with his big workload. He ran 24 times for 129 yards and three touchdowns. This was his first three-touchdown game of his career. It was the fifth time he hit the 100-yard mark, though. Michel gets few catches but continues to have big rushing yardage and touchdown potential in this offense. Fantasy Dud: Rob Gronkowski. The Patriots had a ton of success offensively, but Gronk wasn't part of the fun. He had just a catch in the game, finishing with a catch for 25 yards. This game shouldn't come as a huge shock, though, because his production has been and up and down this year. Gronk has just four games all season with more than 60 yards. He has not been the Rob Gronkowski of past seasons. Game Notes: James White did not have a carry in the game, but led the team in receptions. He got a workout in the passing game, catching 15 passes for 97 yards. This was his third double-digit reception game of the season. Hunter Henry made his season debut, returning from a torn ACL, but was held without a catch. He was targeted just once in the game. Antonio Gates got much of the work at tight end, catching five passes for 41 yards and a touchdown in what might have been his last game. Fantasy Stud: Michael Thomas. Thomas had another one of his monster games, catching 12 passes for 171 yards and a touchdown. He was the focal point of the passing game and produced huge numbers once again. This was the seventh time this season he had double-digit receptions. Thomas is proving he is one of the elite receivers in all of football. Fantasy Dud: Nick Foles. Foles was pretty quiet in what seemed a favorable matchup for him. He was 18-of-31 for 201 yards and a touchdown with two interceptions. Foles had multiple touchdowns three straight games before this dud. He has put himself in prime position to land another starter's job going forward, though, because of his strong play down the stretch. Expect Foles to be starting for some team in 2019. Game Notes: Ted Ginn had three receptions for 44 yards on seven targets. In two games since returning from injury, Ginn has eight receptions for 118 yards on 15 targets. Alshon Jeffery led the Eagles in receiving, catching five passes for 63 yards, but had a costly drop late in the game with the Eagles driving for a possible game-winning score. The ball went right through his hands and to a Saint for an interception. Jeffery finished the season with at least five receptions five of his last six games.